At least one civilian has been killed and four injured after the Ukrainian army shelled the eastern town of Gorlovka, senior rebel forces commander Eduard Basurin told RT. Ukrainian artillery shelled the town on Sunday evening, the mayor of Gorlovka, Andrey Darkovsky, told RIA earlier, confirming at least 5 victims – four men and one woman. A RIA source said the shelling continued for some 40 minutes, with residential areas of Golma and Zaitsevo coming under fire. The Joint Centre for Control and Co-ordination (JCCC) representative meanwhile told RIA that Gorlovka suburbs were shelled by Ukrainian tanks, according to preliminary data. The latest shelling follows last week’s deadly attack on Gorlovka. On May 27 the residential area of the town was hit by a shell killing three people – an 11-year-old girl, her father and another civilian. Basurin blamed the Ukrainian army for both incidents. 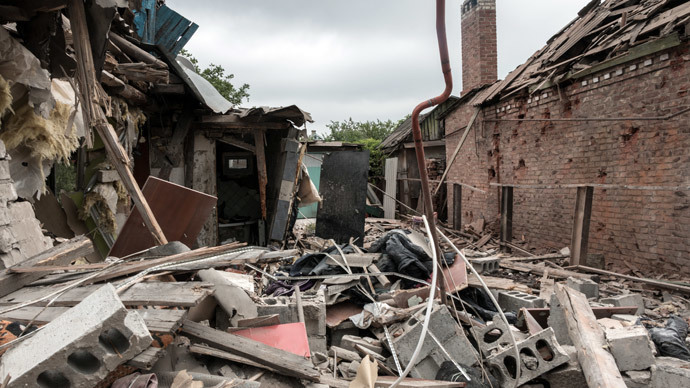 Meanwhile, the Organization for Security and Co-operation in Europe (OSCE) Special Monitoring Mission to Ukraine (SMM) told RT on Thursday that shrapnel used in the May 27 shelling of Gorlovka persistent with 122mmartillery banned under the Minsk II Accords. He was also able to confirm the deaths of civilians to RT. The Minsk peace plan, brokered in the Belarusian capital on February 12 and agreed upon by both sides of the conflict, included the withdrawal of heavy weaponry over 100-millimeter caliber from the frontline and the establishment of a security zone separating them.